BRYAN EATON/Staff photo. 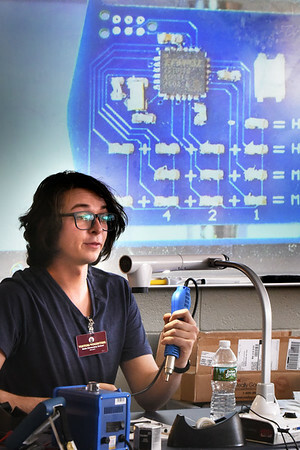 Computer systems engineer Alden Michaels builds a binary watch, projected behind him, at the Molin Upper Elementary School in Newburyport. He's the son of teacher Irene Peyton who is overseeing this STEM (Science, Technology, Engineering and Math) Class which likes to teach by hands on projects and is doing a segment on binary numbers. Binary clocks have no hands and use rows of LED's that represent zeroes and ones.